During Scientific Study of the "Great Blue Hole"
The Cambrian Foundation announced today that it recently completed a successful expedition to study the Great Blue Hole on Light House Reef. 55 miles east of Belize City. Belize. Breathing a mixture of nitrogen. oxygen and helium, expedition members were able to obtain rock and sediment samples and video records of deep marine cave environments. previously only accessible through the use of submersible equipment. Expedition goals set forth primarily by Drs. Robert Dill and Anthony Jones~ were designed to develop knowledge of when and how blue holes form. to develop a more accurate curve of sea level rise that followed the last ice age and to determine if any correlation exists between the effects of Saharan dust storms and algae blooms. 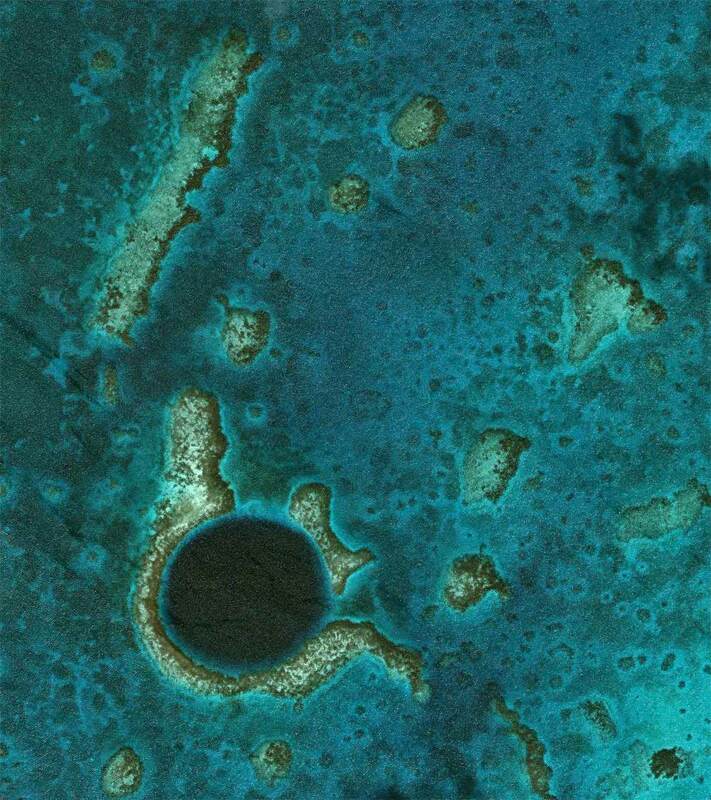 For much more information on the Great Blue Hole, Click here. For a great story on diving to the bottom of the Great Blue Hole, CLICK HERE. Dr. Robert Dill, who obtained samples at relatively shallow depths (90160 FSW) as Chief Geologist on Cousteau's 1970 expedition to the Blue Hole, had waited 27 years to make this return trip to get additional data to answer questions on the geological record concerning average sea levels. 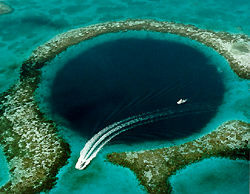 Dr. Dill stressed the importance of this study, "cave deposits formed in air within Belizean Blue Holes down to depths of over 400', could give us new and uncontaminated isotope dates on when the melting continental glaciers caused not only flooding of the Blue Hole, but also the continental margins all over the world." Samples of speleothems, ancient cave deposits, wall rock and video records collected by The Cambrian Foundation provided necessary data to scientists. The great depth of the giant geological feature required the latest advancements in diving technology, underwater video and laboratory techniques in science to ensure the success of the project. Operational objectives required deep dives, routinely to greater than 375FSW, into restricted areas and the recording of features with high resolution video. Core samples from the floor of the Blue Hole will be used to test a hypothesis set forth by Eugene Schinn of the U.S. Geological Survey in St. Petersburg, Florida, which seeks to associate Saharan desert dust storm activity with the development of algae blooms and other pathogens. In addition, divers discovered a new correlation with side caves and faults that reflect the geologic history of this Central American region. A stalactite and stalagmite pair of dripstone speleothems from a newly found submerged cave system on the west wall of the Blue Hole at a depth of 135 feet along with the other samples will be dated by Dr. Yename Asmerom. also a member of the expedition, at the new, state-of-the-art Radioactive Isotope Laboratory at the University of New Mexico. Sampling, under authority from several Belizean governmental agencies, was conducted with extreme care so as not to destroy flooded cave structures and historical records left in the sediments and stalagmites and stalactites formed when the Blue Hole was dry. 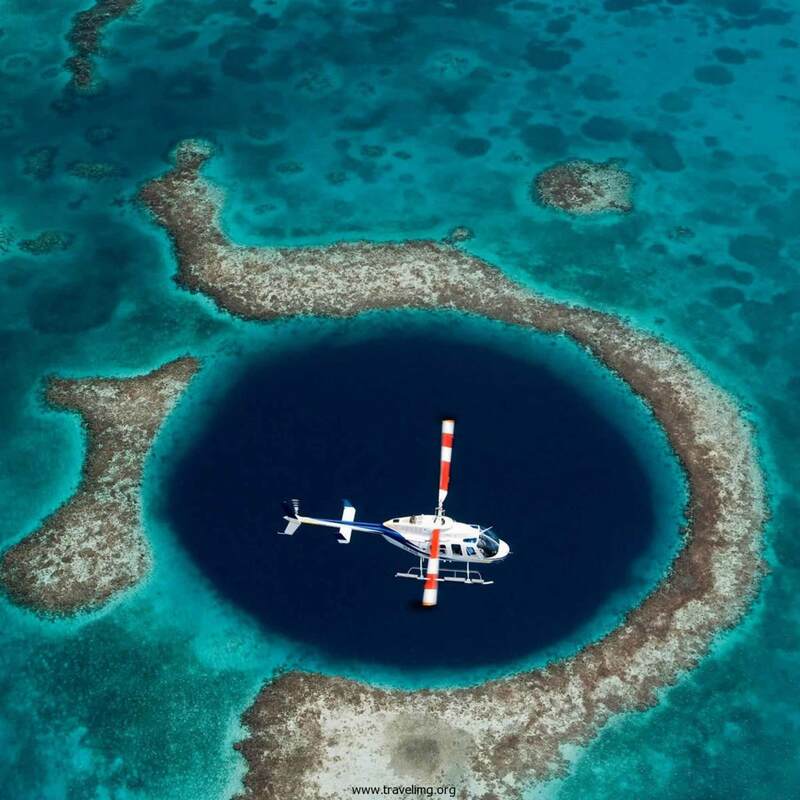 A blue hole is essentially formed when a roof collapses over a cavern and is subsequently filled with water. 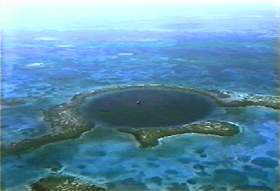 Geological structures in the Great Blue Hole of Belize are important because they initially can only form in air, when caverns are dry and above sea level. Evidence for the maximum lowering of sea level during successive ice ages over the past several millions of years is sparse. 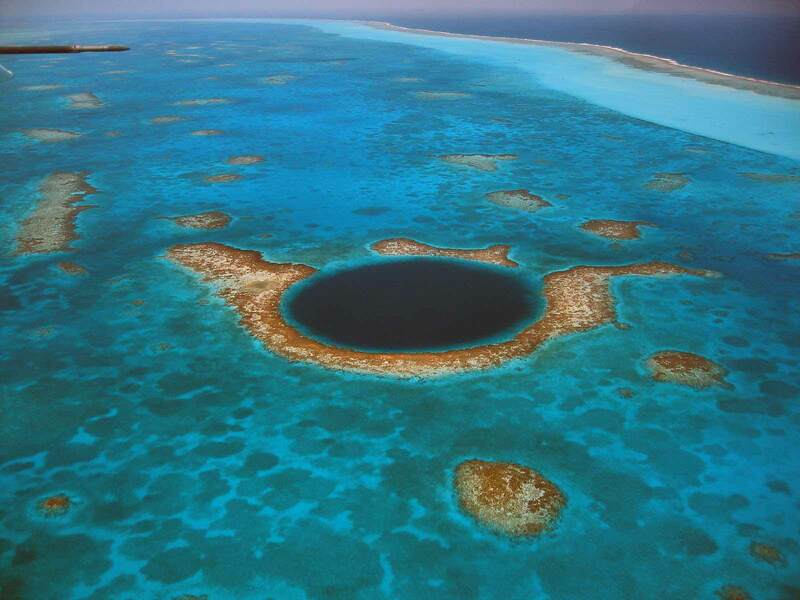 Due to its impressive appearance and mystique the Great Blue Hole was established as a World Heritage Site by the United Nations. Further exploration in an unknown cave system called the Abyss by local fisherman yielded not only a new Belizean underwater cave depth record, but also other important results. Despite the apparent grandeur of The Blue Hole, it is not the deepest underwater karst window in Belize. In the Abyss, team divers Terrence Tysall, Andreas Mathes, Ken Furman, and Dr. Andrew Pitkin descended to 485 FSW to record geological features on video and collected true speleothem samples at 215 FSW. extending the depth range of samples collected. In addition, the team verified other potential samples for collection at 335FSW. 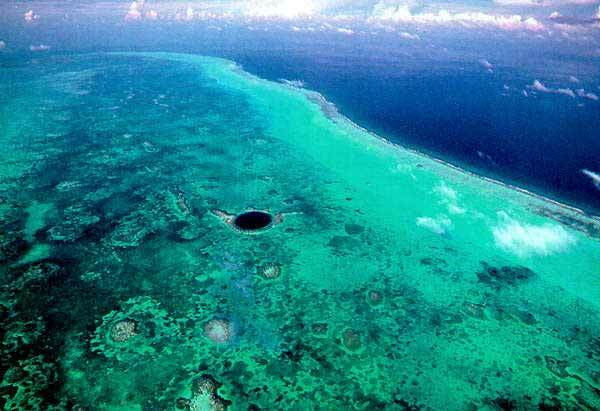 This discovery led the team to believe that the Blue Hole's location and size may have more to do with the reason for the lack of speleothems at depth than the age of its formation. Other accomplishments of the 17 member team included the discovery an offshoot cave on the south wall of the Blue Hole, encouraging results of Doppler testing on mixed gas divers, a study confirming pseudomonas bacteria growth under high oxygen partial pressure study, a survey of the giant speleothem gallery on the south wall and successful dives by six additional Cambrian Foundation members to the bottom of the Blue Hole. The extremely successful results have encouraged the Cambrian Foundation, members of the scientific community in Belize and the US to set up a consortium for future work in the area. Plans are underway to have a follow up series of studies using the Belizean offshore atolls as natural laboratories with field support by deep diving technical personnel. The Cambrian Foundation is a not for profit 501-c3 corporation created in 1994 for the purpose of conducting scientific research, preservation and exploration as well as education of the public in connection with the aquatic and oceanic resources. 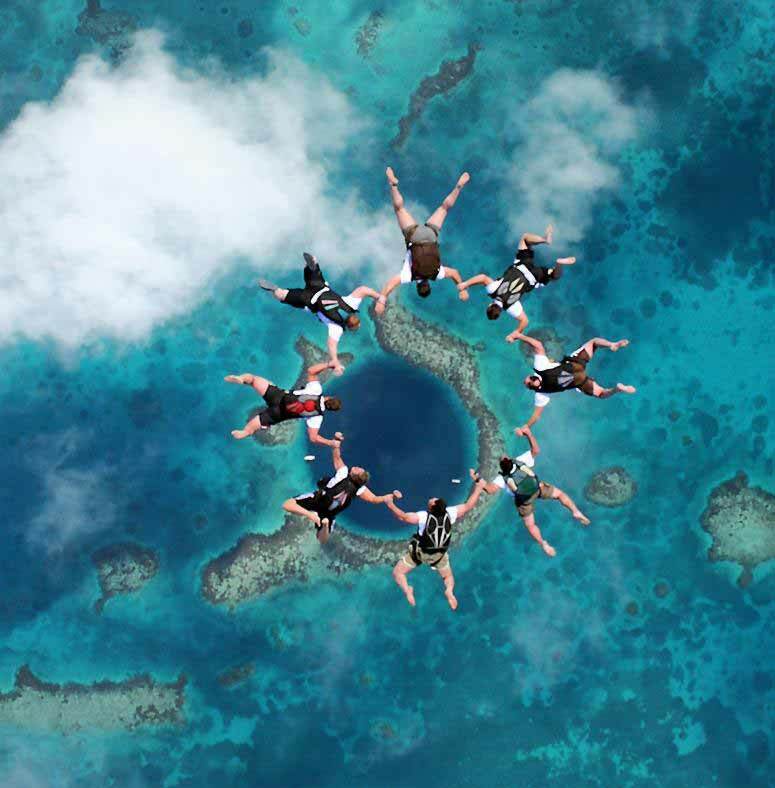 Below are five amazing blue hole photos.